An extended look at the tactical mech combat game. A couple of days ago, it was revealed that Paradox Interactive were teaming up with Shadowrun and Battletech developer Harebrained Schemes to see its promising turn-based strategy game through to completion. 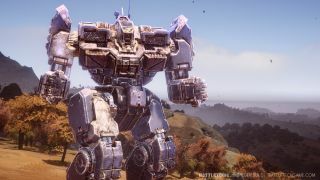 We enjoyed a fun trailer featuring clanky mechs walloping each other, but now we've surprisingly been afforded a longer look, in particular at Battletech's multiplayer mode. There's a multiplayer beta on the way soon, you see, so if you fancy a headstart over the other Kickstarter backers entitled to beta access, or you just want a nice long look at some mechs tactically shooting each other, be sure to absorb the following video. Developer Harebrained Schemes has provided a lengthy list of annotations that go into the friendly match in more detail, which you can read at the preceding link. There's no firm date for Battletech yet, but it should be out sometime this year.